With the growth of fast fashion and perhaps influenced by the feminist movement, we've really moved away from occasional dressing and somewhat away from even seasonal dressing. There are people wearing pajama pants to Walmart, and few ladies these days own a "winter dress" or "spring hat." Most modern clothing is worn year round with fewer or more layers added on to account for weather, but not a seasonal rotation of the wardrobe with specific pieces only meant for particular times of year. Now let us consider the ideal foundation of a woman's wardrobe. Imagine she lives a reasonably active life by day of work and shopping and that evening brings the small dinner party with friends and sometimes a real gala evening. Much depends on the individual but there are certain essentials about which one can safely generalize. For city life: Two well-cut suits are really necessary, one for spring and one for autumn. They should be renewed, if possible, alternate years. One black or brown for autumn, one navy or gray for spring. As they will be worn a great deal, this is not extravagant. One fine wool dress in a soft style, either in black or navy blue. 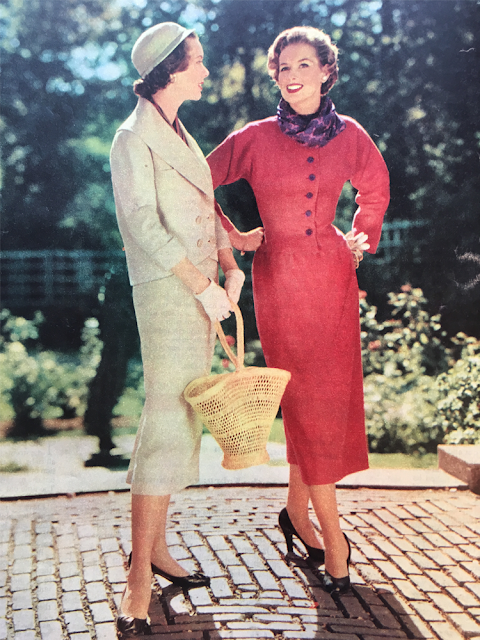 A tailored wool dress which can be worn without a coat. This should be colored, a gray, red, brown, maize-yellow or whatever color you particularly fancy. But of course black or navy is the most convenient. A soft silk dress in a dark color like black or deep marine blue, or this could be in the form of a silk suit. It should not be décolleté and would be suitable for warm daytime wear or informal evening wear. A pleated skirt for being "at ease," to wear with a blouse or sweater for mornings, for general comfort and still looking smart. In black you may wear it until night; more or less jewels will make the difference. One late-day dress which lends itself to a quick transformation. It is not at all correct to wear a very bare-topped dress for early evening--unless you are obviously in full evening dress ready for a later event. But quite often these early parties merge into dinner affairs. So clearly your late-day dress must be right for both. Probably the ideal is a silk dress with a full rather long skirt and a halter neck or strapless bodice. With this goes either a velvet bolero or a tailored jacket of fine wool. Fashion always offers new versions on this theme ever season but unless you go out a great deal you need not buy a new late-day dress very often. 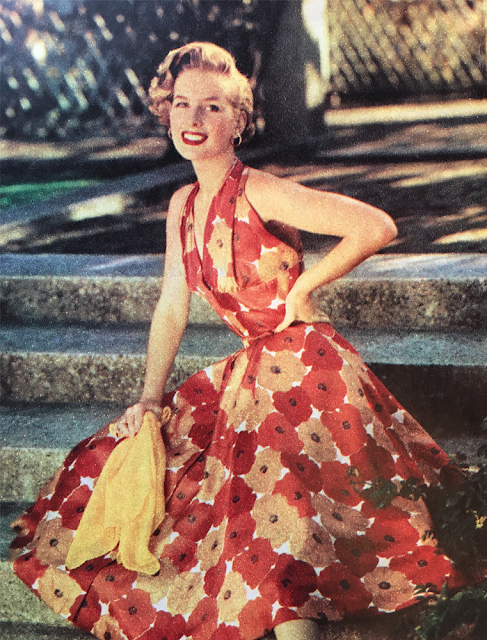 One long dinner dress is often needed by many women and one really gala dance dress. A warm topcoat is of course a necessity and a short jacket is an asset for spring. Be sure that your accessories are chosen to suit the clothes with which you wear them. Shoes are very important. You do not need so many pairs of shoes--but they must be very simple. Pumps are always the best. Buy more hats than clothes! Because hats--especially on dull winter days--make for gaiety. The color of a hat must harmonize with the rest of your clothes but not necessarily match. In fact, it's better if it doesn't match. But accessories like scarf or gloves must go with the hat to "team" it with the rest of your appearance. For country life: I think black is all wrong for the country in the daytime, except for slacks or sweaters, and that tweeds are the only correct things to wear. I would say no dresses for country in the winter. I hate "little colored wool dresses" in the country. I like a simple variation of pleated skirts with jerseys or wool blouses. For evenings, a very full heavy silk skirt with a wool top looks exactly right. But silk slacks (velvet, satin) may be nice too. I see that I have hardly touched on clothes for wear in summertime. That is really so easy. A dark linen or shantung suit or dress is perfect for town. 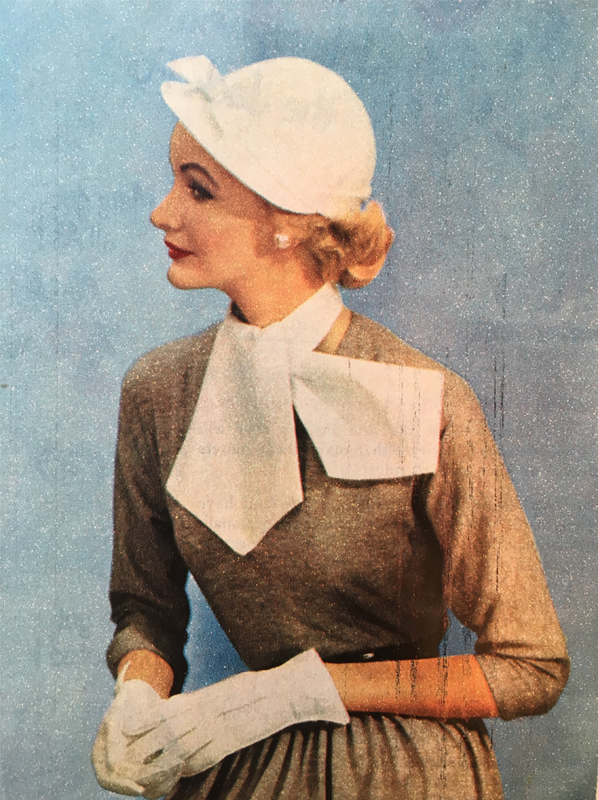 I would say gloves are an absolutely indispensable part of your outfit except on a very hot summer day (or of course in the country or at the seaside). It is quite surprising how a pair of white cotton gloves can give "completeness" to a simple summer dress, even without a hat. On the whole I do prefer to see women wearing hats in the city. A suit without a hat is not good. 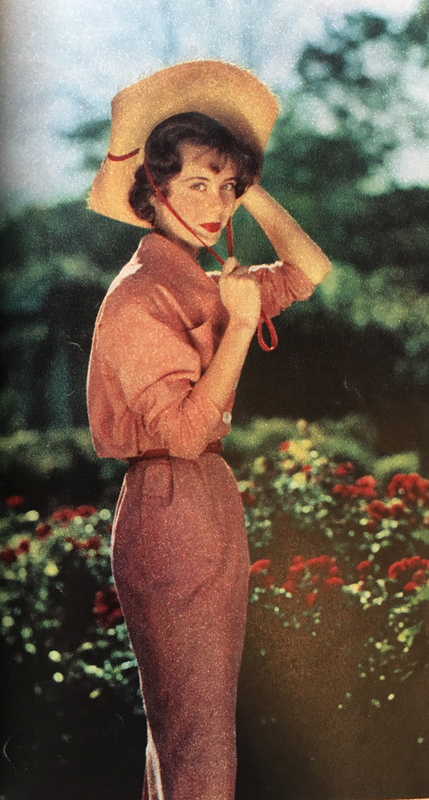 In the summer, especially with short hair, it is possible to look well without a hat; but the grooming of a hatless woman must be even more impeccable than usual if she is not to seem rather slovenly and underdressed. In the country you can wear gay cottons. It is very bd taste to be dressed in too rich materials or much glittering jewelry on light summer evenings. Keep to summery fabrics. For me, some of this is a bit fussy for modern life (late-day dress? ), but I also wish we had more formal dinners and such, even if just with friends in our homes, drinking out of fancy glasses and listening to music and good conversation. I'd be willing to give it a shot! 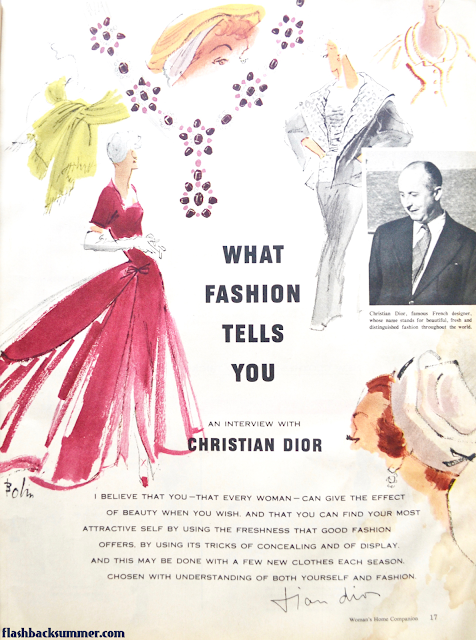 And did you read Dior say NOT to wear a dress?! That was shocking to me, but quite practical. I think he has some great points! What's your favorite tip? Great post, thank you! I am actually one of those people who rotates their wardrobe. I have a particular set of clothes I wear in the summer and another I wear in the fall/ winter. Just the other day I took out my wool dresses and some of my fall pieces. I do the same with my gloves, hats, shoes, etc. I know it may seem a little odd but wool in the summer does not go over very well sometimes. Rotating my wardrobe, I think, extends its wearable life too. Is my entire wardrobe rotated? No, I have some staple pieces too. I wish that people would look for excuses to "dress up", rather than to "dress down", as it so often seems to be in our culture. (Jeans at evening galas anyone?) When did people stop dressing up anyways? It's so boring! I enjoyed what he had to say in this post, and I'll be seeing where I can apply some of his advice to my own wardrobe. Hear hear! I agree completely! I find/make excuses to dress up, since fancy occasions are so rare these days! Oh good, I'm glad! That dictionary sounds awesome! And yes, he has such classic, easy principles. And too bad we don't live nearer or I would figure out some sort of semi-formal card playing something to invite you to, haha!